After a terrifying three weeks of multiple package bomb attacks, the Austin bomber was finally located early on March 21. The call was put out from a Texas Department of Public Safety helicopter circling over Round Rock. The helicopter's pilots said they finally had the Austin serial bomber in their sights. Now, the newly released footage shows the dramatic events that unfolded next. "I’ve got him eastbound … coming up to (Interstate) 35 frontage," the pilot announced to numerous federal, state and local police below. The DPS video was released on Friday and shows the suspect Mark Conditt fleeing in his SUV with Austin SWAT in close pursuit. At one point, the SWAT team's van slams into Conditt's SUV in an effort to stop him. "Van’s made contact with him!" the pilot reported. Officers then began pounding on Conditt's SUV's window despite knowing the danger since he most likely had a bomb. Sure enough, a blinding fireball erupts from the bomber's vehicle knocking officers several feet back. "Got an explosion! Got an explosion inside the vehicle!" the pilot above can be heard calling out over the radio. The blast killed the 23-year-old Conditt ending his life instantly ending the spree of random bombings that left Austin residents terrified. City leaders called the officers who ran toward Conditt heroes and thankfully none of them were killed by the blast. 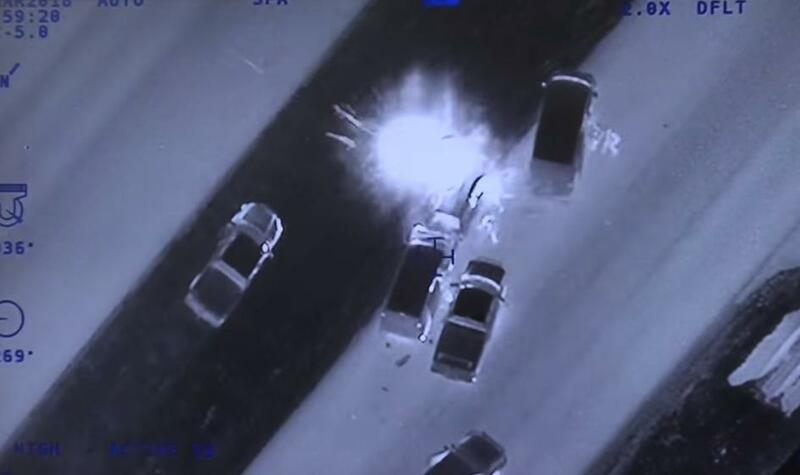 The newly released helicopter video was released to the American-Statesman and marks the first major piece of evidence in the Austin bomber case to be publicly released. DPS Director Steve McCraw told the commissioners, "You can see why local law enforcement needs air support." The Austin bomber's spree killed 39-year-old Anthony House and 17-year-old Draylen Mason. 75-year-old Esperanza Herrera was also severely injured by a package bomb left outside her mother's house. Two others were also injured by a trip-wire explosive device in Southwest Austin. Conditt, an Anti-Christian was struggling with his sexuality. Just like Omar Mateen, the 29-year-old who shot and killed 49 people at the Orlando gay nightclub Pulse back in 2016. The 2 males whom he lived with, told Police they thought Conditt was gay. IT Forensic searches uncovered evidence that he used Grindr to exchange messages with gay men. In short an Confused Liberal Gay Mail who should have shalt Mental Health Services. Probably the best ending. … Saved court costs, plea bargaining, taxpayer supported incarceration, and possible future release by a Lib judge.